The rise of smartphones has created a booming app industry worth billions of dollars. Apple alone claims it has created close to 300,000 jobs in the U.S. and paid out over $6 billion to developers. But with hundreds of thousands of apps to choose from, it’s increasingly difficult for small developers to get noticed, so much so that just 25 mostly well-known companies account for half of app revenue on the two dominant app stores. That’s according to an estimate by Canalys taking into account revenue generated by Apple’s App Store and Google’s Play in the U.S. during the first 20 days of November. These 25 developers earned $60 million from paid-for downloads and in-app purchases, and save for Pandora, all are gaming firms. The list includes companies like Zynga, Electronic Arts, Disney, Kabam, Rovio, Glu, Gameloft and Storm8’s TeamLava. Canalys attributes part of these results to the fact that larger game developers tend to have multiple titles on offer and are able to cross-promote them. Zynga, for example, had 15 titles in the list of top 300 grossing iPhone apps on average in Apple's App Store every day, and 9 in the equivalent list for Google Play. Games accounted for 145 of the top 300 paid apps in Apple’s App Store and 116 of the top 300 paid apps in Google Play. 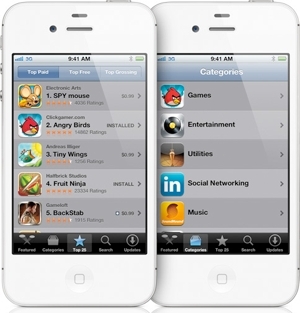 The category also accounted for 94 of the top 300 free apps for Apple and 110 for Google Play. A separate study conducted by GigaOm a couple of months ago further reinforces the notion that app developers are in for quite a challenge to get their apps noticed and monetize them. According to the report, more than half of 352 respondents say they make less than $500 a month from their paid apps. For most of them app development isn’t a full time job, but at least 5% of them claim to be making over $20,000 a month.